"Om Bhur Bhuvah Swaha Tat Savitur Varenyam Bhargo Devasya Dheemahi Dhiyo Yo Nah Prachodayath"
We meditate on God's glory, who has created the universe, who is fit to be worshipped, who is the embodiment of knowledge and light, the remover of all sins and ignorance. May He enlighten our intellects. Since the very first program that took place in February 2010, this event has been blessed with so many Divine 'visiting cards' from God. On one program, Sai Baba appeared on a glass of water (please see the below photographs). Before the start of another program, devotees from a centre were questioning the purpose of this program, since Sathya Sai Baba had already taken 'Maha-Samadhi', and so they asked Sai Baba to give them a sign about the program's validity... Sai Baba manifested Vibuthi on a printed version of the email that had been sent out (which described the purpose of the this initiative (please see the below photographs). Every two months, on the last Saturday of that month; Spiritual Devotees from all over the globe chant on the same day: From UK to India; from USA to Iraq! "Many men and women were seated in the gallery, but I took care that none noticed My injuries. I pretended as though nothing had happened. The Vice Chancellor was worried, thinking that Swami was unable to get up. I knew that any further delay would cause anxiety in the minds of devotees. So, I immediately got up, forgetting the pain, and started blessing the devotees waving My hands. The pain was very severe, and the cut on My hand was so deep as though it was pierced with a knife. Actually the sleeve of the robe covering My hand should have been torn before I got the injury. But the cloth was not torn at all. This incident gives you a glimpse of the infinite power of Divinity. …I detached Myself from the body. My body was numb. There was no sensation whatsoever." We are all obeying Him and accepting the Truth and Knowledge that He has gifted us with. The Gayatri Mantra chanting is taking place, as an Unconditional and Universal prayer, dedicated to the One Godhead, asking He/She to always care for the Avatars' physical well-being, just as God always, selflessly cares for all of our well-being too. "What medicine did I use? The intense prayers of the devotees are my medicine... This body is not mine. It is yours. Hence, it is your responsibility to look after this body... I have never used my divine powers to cure myself..."
"The loving prayers of my devotees will heal me... the prayer of the devotees is the panacea for this body. Their prayers have given me immense bliss." "...it is your responsibility to look after this body. I am not the body (deha); I am the Dehi (Indweller)." Further to this point; I would like to mention that some may ask why we are continuing to chant for God's well-being, if the form of Bhagavan Sri Sathya Sai Baba has taken Maha-Samadhi? The answer is very obvious. Who is Sathya Sai Baba? Who is Shirdi Sai Baba? Who is Jesus? Who is Buddha? Who is Rama, Krishna, Vishnu, Gayatri, Laxmi, Mary, Hanuman, and who is Prema Sai Baba? 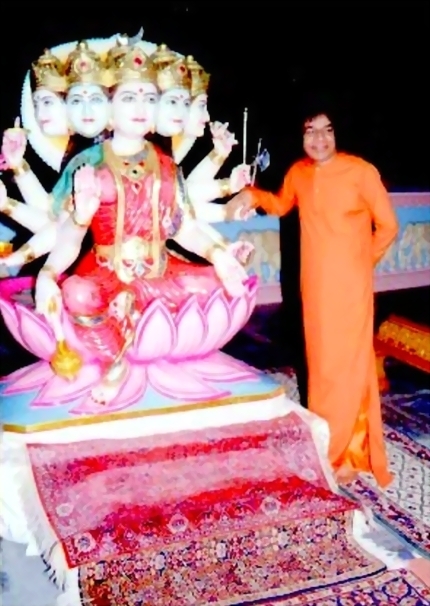 – The same One and Only; Bhagavan Sri Sathya Sai Baba; the same One entity of Pure Love: God! "I incarnate from age to age..."
...So, why would we ever stop now that He given this valuable knowledge to us all? - We do not stop! This program is uniting devotees from all over the world, asking them to come together and it is teaching us all to have Unconditional love for God. Sai Baba has explained that loving God; Unconditionally, without any expectation or asking for anything in return is the highest type of Devotion! – Love God, for the simple and pure sake of loving Him! Love Him alone, asking for nothing in return. Our joy and reward is in loving Him! Why are we chanting Unconditionally, without any personal desires, including for reasons such as world peace? Why is this program strictly sticking to chanting with Pure, Unconditional Love to God and only focusing on the physical comfort of the Avatars' bodies? What about worries of personal sickness, what about world peace, etc? "....since there is no fruit or object more valuable than God or more worthwhile than God, the Vedas advise us to love God, with no touch of desire in our minds. Love, since you must love for love’s sake; Love God, since whatever He can give is less than He Himself. Love Him alone, with no other wish or demand". The reason why the above quote is so important is because it discloses the Supreme secret of the answer to Bhakti (Devotion)! Sai Baba is explaining how Devotion should ultimately be practised. "To earn the grace of God, there is only one recipe: Obey His orders without murmur." While it is good to pray for noble things, such as individuals' health and wholesome requests such as world peace; this one program is solely dedicated to a unique and essential cause, being of Unconditional Love to God. When we Surrender to Him whole-heartedly; there is no reason to even ask for anything, as He will take care of all of our needs. "Why Fear when I am here?" Imagine a world with only 'Sai Babas' living in it! - There would be no need for any concerns such as world peace even, as there would be no worries and no conditional/'selfish' requests, demands or desires. All would be Love and Peace! If however, we make laws, and the subjects of society; us, as a people, as individuals have not changed and become Pure, Unconditional Love, then how long can national or international, or universal peace last for? And, was it truly peace anyway, when people carried selfish desires, maya and conflict inside of them? If we pray for peace, and even if He grants it: Individuals themselves will break the peace in their homes, society, and in the world. So change on the inside, as this will bring change on the outside. As He explains, life is a reflection. The moment you become Surrendered and at Peace, you shall all experience this same True Peace in the world too! Concentrate on your inner being, your true Self, and change as an individual. If we all focus on Baba's message of peak Bhakti/Devotion and change as individuals, we will then solve the problems in the world. No mass conflict, no personal accumulation of karma either. Laws get broken when criminals live in society. However, laws are not even needed when society; it's people are good. Love without Duty is Divine." Another point is this: To chant the Gayatri Mantra properly, it has to be chanted Unconditionally, as the prayer is just an expression and focus of Love to God. This is why our Father has explained that even though we may give up any other prayer, we should never give up the Gayatri Mantra. Mother Gayatri gives us Buddhi (Divine Wisdom) and that Wisdom is to become this One True Love, by merging with God, who is Love Himself! So, Surrender to Him and merge; become Him! Why are we focusing on God's well-being?... The human mind needs to focus on something, and this purpose helps us express our Love to Him. Most importantly, this knowledge is Truth and a gift from Sathya Sai Baba. We are all here to play our part in this game of Love and Life. Let's do the one thing the Avatars do not do for themselves, and pray and ask them to care for their own well-being too, just as they care for ours, their Spiritual and Divine Children. "...it is your responsibility to look after this body. I am not the deha (body); I am the Dehi (Indweller)." "I incarnate from age to age". "Gayatri is the embodiment of all forms of Godhead - Sarva Devatha Swaroopman. Gayatri does not belong to any caste, to any sect or to any religion as such. It is universal in it's scope." "Never give up the Gayatri; you may give up or ignore any other mantra but you should recite the Gayatri at least a few times a day." "Gayatri is the Mother of all scriptures (Vedas). She exists, wherever Her name is chanted. She is very powerful. The One who nourishes the individual being is Gayatri. She bestows pure thoughts on anyone who worships Her. She is the embodiment of all Goddesses. Our very breath is Gayatri, our faith in existence is Gayatri. 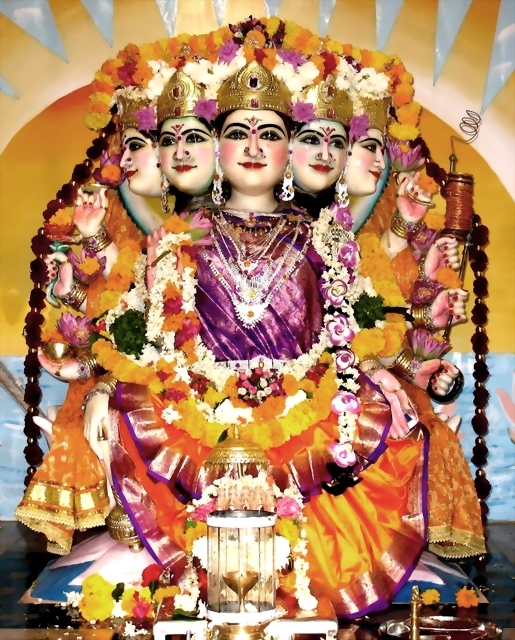 Gayatri has five faces, they are the five life principles. She has nine descriptions, they are ‘Om, Bhur, Bhuvah, Swah, Tat, Savitur, Varenyam, Bhargo, Devasya’. Mother Gayatri nourishes and protects every being and She channelises our senses in the proper direction. ‘Dheemahi’ means meditation. We pray to her to inspire us with good intelligence. ‘Dheeyo Yonah Prachodayat’ - We beseech her to bestow on us everything we need. Thus Gayatri is the complete prayer for protection, nourishment and finally, liberation." "Never stop, never stop, never stop!"